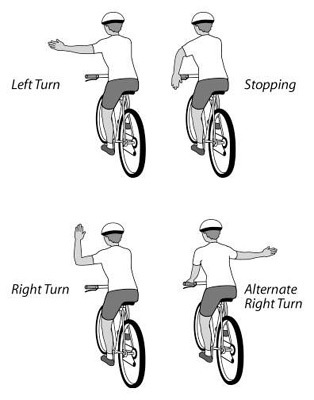 It is a very good idea to use hand signals when riding in a group. It lets the cars and other rides know what you will do. It is a good idea to CALL OUT when you see a road hazard. Call it out loud and clear to gain the attention of riders near you. You want them to hear you above the traffic and wind noise. The most import call out is "STOPPING" It is also a good idea to use non rhyming words as it is difficult to distinguish words like "ROLLING" "GOING" or "SLOWING" So say something like "STOPPING" and "PEDALING"
When riding in a group, the riders up front will have a good view of the road surface. It is up to these riders to pick a good line and point out any road hazards. This signal applies for pot holes, sewer grates, road kill, sand, broken glass, etc.